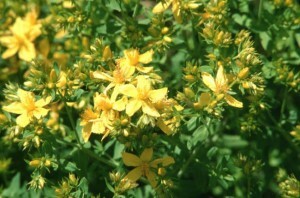 St. John’s Wort extract is effective as an anti-depr essant in the management of mood disorders. Because the herb has an important side effect of increased photosensitivity, it may be best to consider St. John’s Wort as a winter time remedy. Although internal use of St. John’s Wort increases one’s sensitivity to the sun, when applied to the skin St. John’s Wort Oil acts as a sunscreen. What a beautiful balance offered by one herb! St. John’s Wort is also potentially effective against MRSA (methicillin-resistant Staphylococcus aureus). See related post here. St. John’s Wort can alter the metabolism of pharmaceuticals that you are taking concurrently. Speak with your acupuncturist, herbalist or other health care practitioner before beginning internal use of St. John’s Wort to be certain it is right for you. Written by Lana at 8:36 pm and filed under All About Herbs, Specific Conditions.